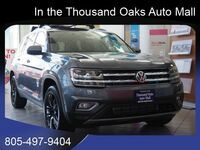 Buying a 2019 Volkswagen Atlas in Thousand Oaks, CA is a great idea for Ventura County families looking for a new vehicle. Sporting three rows of comfortable seating and a wealth of advanced interior features, this SUV was built with modern sensibilities in mind. 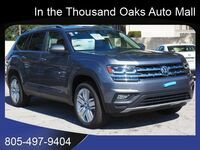 The 2019 iteration of the Volkswagen Atlas is offered in two more trim levels than the 2018 Atlas.  This three-row midsize SUV is available in seven total trim levels, which include S, SE, SE w/ Technology, SE w/ Technology R-Line, SEL, SEL R-Line and SEL Premium. 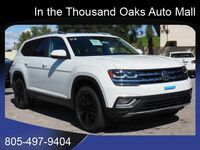 The 2019 Volkswagen Atlas S comes with a turbocharged, four-cylinder engine (235 horsepower, 258 pound-feet of torque) while higher trim levels feature a 3.6-liter V6 engine (276 hp, 266 lb.-ft.). For Volkswagen engineers, safety always comes first. Standard safety features are in abundance inside this SUV. Every 2019 Atlas comes equipped with a crash-optimized front end, LATCH child seat anchor points, a tire pressure monitoring system, an intelligent crash response system, an anti-lock braking system and electronic stability control. Optional driver assistance features include adaptive cruise control, an active blind-spot monitoring system and lane keeping assistance. This SUV’s cabin is as spacious as it is safe. 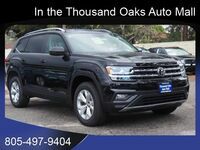 The 2019 Atlas was determined to have an interior volume of 174.3 cubic feet by the Environmental Protection Agency. 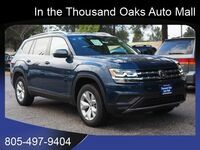 This spacious interior means more room for cargo as well: The 2019 Volkswagen Atlas has a standard cargo capacity of 20.6 cubic feet and a maximum cargo capacity of 96.8 cubic feet. Available 2019 Volkswagen Atlas accessories include: A cargo area privacy cover, hitch mount bike carrier attachment, roof carrier bars, kayak holder attachment, universal tablet holder, rear bumper protection plate, splash guards, hood deflector, roof basket and a MuddyBuddy® trunk liner.